​If you’re searching for a versatile, affordable little craft for having fun on the water then the Old Town Twister could be what you’re after. But is it any good? We’ve checked out its features to see who it’s designed for and if it might be an ideal vessel to take on your next family beach trip. ​The Twister is a single sit-on-top kayak designed for recreation. It’s built for fun on the water, whether it’s a lake, river or the ocean and could make a good vessel for beginners. It’s a sit-on-top craft so is designed for warm weather paddling, which could make it ideal for family days out where you may also want to jump off for a swim. The molded-in seat features a small contoured back rest for added comfort when you’re on the water. Because the seat is molded into the hull, it’s designed to fit a range of paddlers and has added durability. For extra comfort and stability, there are also molded footrests to suit different sized paddlers. The Twister is a versatile craft that is ideal for many types of water, including lakes, rivers and ocean waves. This can make it a good choice for taking on family beach trips or days out at your local lake. It’s lightweight, with molded carry handles, which can make it easier to transport. Its short length can also aid maneuverability on the water. The Twister could be a great craft for kids and beginners, as it can be fun to paddle and easy to get in and out of. Because of its sit-on-top design it can be better for warm weather paddling, as the shallow sides can cause water to splash on deck. For being a small recreational yak, the storage area at the rear is pretty spacious. The molded tank well could hold a small cooler or picnic gear if you’re out exploring. There is also bungee rigging to help secure your items when you’re on the move. As well as this, there’s a bungee paddle holder to keep your paddle safe and a molded cup holder so you can stay hydrated. There’s also a skid plate to help protect the hull against damage if it’s dragged along the ground. The Tribe is an 11 foot 5 inch yak designed for solo paddling in all types of water. It has an adjustable padded seat, molded foot rests, lots of space for gear and a large 350 pound capacity. Like the Twister, it’s a sit-on-top recreational yak that can be ideal for beginners. The Caper is 3 inches shorter than the Twister but has additional storage space, including a bow hatch with hull storage access and a large tank well at the stern. It also has a tri-form hull for improved stability and there’s a padded seat for comfort. If you’d prefer to have more of your family join you on the water, the 10 foot Manta could be ideal. 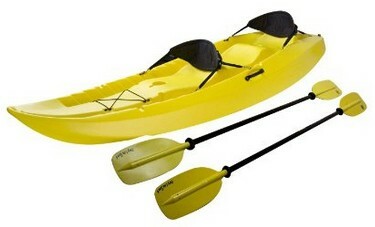 It has three molded seats for three paddlers and can be paddled solo from the center seat. It’s stable and compact and could be easy to use for beginners. The Old Town Twister could be a great kayak for kids or new paddlers looking to explore lakes and rivers or have fun on the ocean waves at the beach. It’s lightweight, durable and has a spacious seating area for added comfort. If you want to make your next beach trip more fun, check out the Twister here. And make sure you let us know how you get on. Why don’t you encourage your friends to get one too - just share this with them. Is This Kayak Ok For Beginners? ​Yes, it’s ideal for beginners and intermediates. ​Is It Easy To Get Into And Out Of? ​Yes, kids and beginners should find it easy to get in and out.